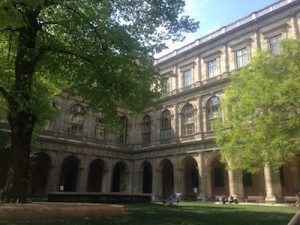 The main building of the University of Vienna is always on the list when I show friends, who are visiting, around Vienna. One reason is that I spent three years there myself studying my undergraduate degree in English literature, culture and linguistics. The other reason is that I genuinely think it’s a beautiful building with a rich history and also a hidden spot because not many people know you are allowed to enter it without a tour. Therefore, I would like to share my favourite hidden spot within this hidden spot. 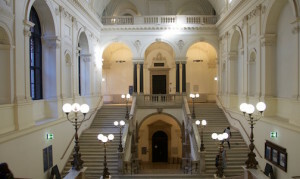 To reach the entrance hall just walk up the main stairs. Since the university is a public building, you can simply walk inside. On the left hand side you’ll see an alcove with an entire wall of names engraved in gold. These are the names of previous chancellors going back to 1365. That’s how old the university is, though not the building (that’s from the late 19th century, designed by Heinrich von Ferstel). Next to this alcove are glass plates with images of Nobel Prize winners linked to the university. There is also one with a question mark, to symbolize how many more Noble Prize winners there could have been if women had been given access to university earlier and if Jewish and other scholars hadn’t had to flee because of the Nazis. A favourite place of many students to meet others or enjoy a break between lectures is the Arkadenhof. Located at the heart of this building, you can access this courtyard by walking straight through the entrance hall. In the warmer months, you will find deck chairs that you can rest in, while you bask in the sun and relaxed atmosphere. Walking through the arcades, you can play which famous academic do you recognize, an easy one being Sigmund Freud. What you will also notice that the overwhelming majority of these honoured academics are men. Only at the centre of the courtyard is a statue of a woman, a muse who is there to inspire. Right in front of it is my favourite artwork of the university. On the floor you will find the black outline of the woman rising and walking away. The piece is called “Der Muse reicht’s” – which means the muse is done with being just a muse. 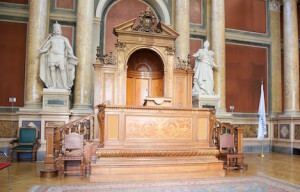 Usually the Festsaal is open to the public. However, you should open the door carefully, in case there is an event going on. For example, this is where I had my graduation ceremony. Walking into this hall you can feel the long history of the university. If you examine the ceiling you will see replicas of what used to be paintings of the four main faculties by famous art nouveau painter Gustav Klimt, which were unfortunately destroyed during World War II. I don’t think there has been a single time where I showed people the main library (which in my defence doesn’t include the department library I used during my studies) and had not gotten lost. It’s almost a tradition by now. If you can manage to find it by following the signs for “Bibliothek”, the glimpse into the Great Reading Hall is worth it. Unfortunately, you cannot go inside with any jackets or backpacks so that glimpse will probably have to be enough. There is also a small exhibition next to the entrance of the Great Reading Hall with frequently changing topics. Walking into the university you will quickly notice the symmetric architecture. Very quickly hallways, as magnificent as they are to admire, start to look the same and you get lost. 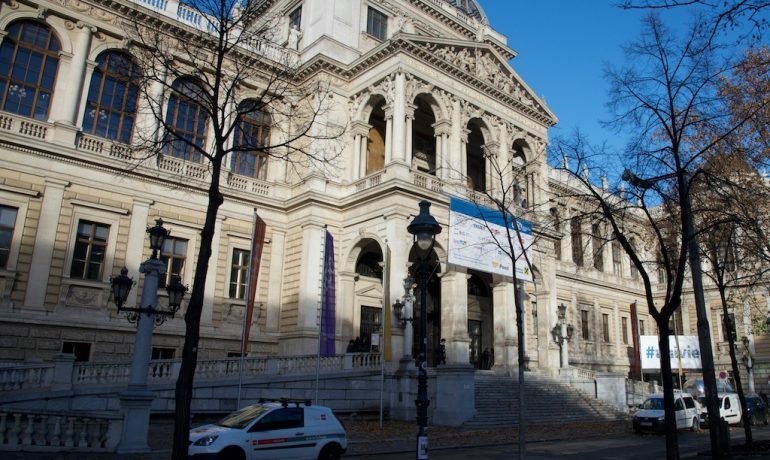 Congratulations, you are experiencing the full University of Vienna experience. Enjoy taking the scenic route and follow the directions on the blue signs on the wall. 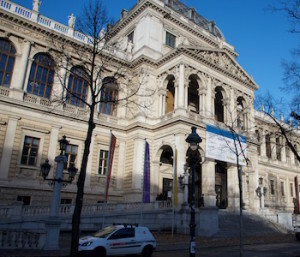 My first thought on entering the University of Vienna was how students are studying here daily without being distracted by the classic architecture. From the white staircases, busts and statues of past alumni and painted ceilings, the university feels like art piece than a place of study. But the university does not feel like a gallery where you’re not supposed to touch a thing (though I’d recommend not touching anything that looks valuable). The university is an interactive showpiece, where student and visiting admirers alike can be part of of the vibe. This is quite evident in the Courtyard, where even at temperatures within the teens, I found a place to kick back and take in the surroundings. The buildings don’t impose on the space of green but compliment nature, creating an atmosphere of tranquility and focus. No wonder it’s a favourite space of the student body.